Haj Amin al-Husseini, the most influential leader of the Arabs in Palestine, lived in Germany, during the Second World War He met Hitler. Ribbentrop and other Nazi leaders on various occasions and attempted to coordinate Nazi and Arab policies in the Middle East. The following is a record of a conversation between the Fuhrer and the Grand Mufti of Jerusalem, in the Presence of Reich Foreign Minister and Minister Grobba in Berlin. The Grand Mufti began by thanking the Fuhrer for the great honor he had bestowed by receiving him. He wished to seize the opportunity to convey to the Fuhrer of the Greater German Reich, admired by the entire Arab world, his thanks for the sympathy which he had always shown for the Arab and especially the Palestinian cause, and to which he had given clear espressos in his public speeches. The Arab countries were firmly convinced that Germany would win the war and that the Arab cause would then prosper: The Arabs were Germany's natural friends because they had the same enemies as had Germany, namely the English, the Jews, and the Communists. They were therefore prepared to cooperate with Germany with all their hearts and stood ready to participate in the war, not only negatively by the commission of acts of sabotage and the instigation of revolutions, but also positively by the formation of an Arab Legion. The Arabs could he more useful to Germany as allies than might he apparent at first glance, both for geographical reasons and because of the suffering inflicted upon them by the English and the Jews. Furthermore, they had had close relations with allMoslem nations, of which they could make use in behalf of the common cause. The Arab Legion would he quite easy to raise. An appeal by the Mufti to the Arab countries and the prisoners of Arab, Algerian,Tunisian, and Moroccan nationality in Germany would produce a great number of volunteers eager to fight. 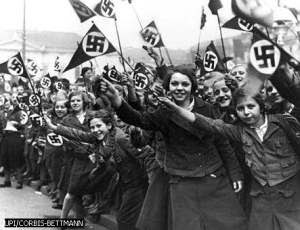 Of Germany's victory the Arab world was firmly convinced, not only because the Reich possessed a large army, brave soldiers, and military leaders of genius, but also because the Almighty could never award the victory to an unjust cause. In this struggle, the Arabs were striving for the independence and unity of Palestine, Syria and Iraq. They had the fullest confidence in the Fuhrer and looked to his hand for the balm on their wounds which had been inflicted upon them by the enemies of Germany. A public declaration in this sense would be very useful for its propagandistic effect on the Arab peoples at this moment. It would rouse the Arabs from their momentary lethargy and give them new courage. It would also ease the Mufti's work of secretly organizing the Arabs against the moment when they could strike. At the same time, he could give the assurance that the Arabs would in strict discipline patiently wait for the right moment and only strike upon an order from Berlin. The Turks, he believed, would welcome the establishment of' an Arab government in the neighboring territories because they would prefer weaker Arab to strong European governments in the neighboring countries, and, being themselves a nation of 7 million, they had moreover nothing to fear from the 1.700,000 Arabs inhabiting Syria. Transjordan, Iraq. and Palestine. France likewise would have no objections to the unification plan because she had conceded independence to Syria as early as 1936 and had given her approval to the unification of Iraq and Syria under King Faisal as early as 1933. 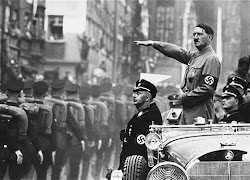 In these circumstances he was renewing his request that the Fuhrer make a public declaration so that the Arabs would not lose hope, which is so powerful a force in the life of nations. With such hope in their hearts the Arabs, as lie had said, were willing to wait. They were not pressing for immediate realization of their aspirations: they could easily wait half a year or a whole year. But if they were not inspired with such a hope by a declaration of this sort, it could be expected that the English would be the gainers from it. The Fuhrer replied that Germany's fundamental attitude on these questions, as the Mufti himself had already stated. was clear. 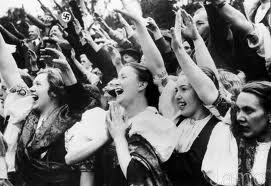 Germany stood for uncompromising war against the Jews. That naturally included active opposition to the Jewish national home in Palestine. which was nothing other than a center, in the form of a state, for the exercise of destructive influence by Jewish interests. Germany was also aware that the assertion that the Jews were carrying out the function of economic pioneers in Palestine was a lie. The work there was done only by the Arabs, not by the Jews. Germany was resolved, step by step, to ask one European nation after the other to solve its Jewish problem, and at the proper time direct a similar appeal to non-European nations as well. Germany was at the present time engaged in a life and death struggle with two citadels of Jewish power: Great Britain and Soviet Russia. Theoretically there was a difference between England's capitalism and Soviet Russia's communism: actually, however, the Jews in both countries were pursuing a common goal. This was the decisive struggle: on the political plane, it presented itself in the main as a conflict between Germany and England, but ideologically it was a battle between National Socialism and the Jews. It went without saying that Germany would furnish positive and practical aid to the Arabs involved in the same struggle, because platonic promises were useless in a war for survival or destruction in which the Jews were able to mobilize all of England's power for their ends. The aid to the Arabs would have to be material aid. Of how little help sympathies alone were in such a battle had been demonstrated plainly by the operation in Iraq, where circumstances had not permitted the rendering of really effective, practical aid. In spite of all the sympathies. German aid had not been sufficient and Iraq was overcome by the power of Britain, that is, the guardian of the Jews. The Mufti could not but he aware, however. that the outcome of the struggle going on at present would also decide the fate of the Arab world. The Fuhrer therefore had to think and speak coolly and deliberately, as a rational man and primarily as a soldier, as the leader of the German and allied armies. Everything of a nature to help in this titanic battle for the common cause, and thus also for the Arabs. would have to he done. Anything, however, that might contribute to weakening the military situation must be put aside, no matter hose unpopular this move might be. Germany was now engaged in a very severe battles to force the gateway to the northern Caucasus region. The difficulties were mainly with regard to maintaining the supply. Which was most difficult as a result of the destruction of railroads and highways as well as of the oncoming winter. If at such a moment, the Fuhrer were to raise the problem of Syria in a declaration, those elements in France which were under de Gaulle's influence would receive new strength. They would interpret the Fuhrer's declaration as an intention to break up France's colonial empire and appeal to their fellow countrymen that they should rather make common cause with the English to try to save what still could be saved. A German declaration regarding Syria would in France he understood to refer to the French colonies in general, and that would at the present time create new troubles in western Europe, which means that a portion of the German armed forces would be immobilized in the west and no longer he available for the campaign in the east. 3. As soon as this had happened, the Fuhrer would on his own give the Arab world the assurance that its hour of liberation had arrived. Germany's objective would then be solely the destruction of the Jewish element residing in the Arab sphere under the protection of British power. In that hour the Mufti would be the most authoritative spokesman for the Arab world. It would then be his task to set off the Arab operations which he had secretly prepared. When that time had come. Germany could also he indifferent to French reaction to such a declaration. Once Germany had forced open the road to Iran and Iraq through Rostov, it would he also the beginning of the end of the British world empire. He (the Fuhrer) hoped that the coming year would make it possible for Germany to thrust open the Caucasian gate to the Middle East. For the good of their common cause. it would he better if the Arab proclamation were put off for a few more months than if Germany were to create difficulties for herself without being able thereby to help the Arabs. He (the Fuhrer) fully appreciated the eagerness of the Arabs for a public declaration of the sort requested by the Grand Mufti. But Ire would beg barn to consider that he (the Fuhrer) himself was the Chief of State of the German Reich for five long years during which he was unable to make to his own homeland the announcement of its liberation. He had to wait with that until the announcement could he made on the basis of a situation brought about by the force of arms that the Anschluss had been carried out. The moment that Germany's tank divisions and air squadrons had made their appearance south of the Caucasus, the public appeal requested by the Grand Mufti could go out to the Arab world. The Grand Mufti replied that it was his view that everything would come to pass just as the Fiihrer had indicated. He was fully reassured and satisfied by the words which he had heard from the Chief of the German State. He asked, however, whether it would not be possible. secretly at least, to enter into an agreement with Germany of the kind he had just outlined for the Fuhrer.